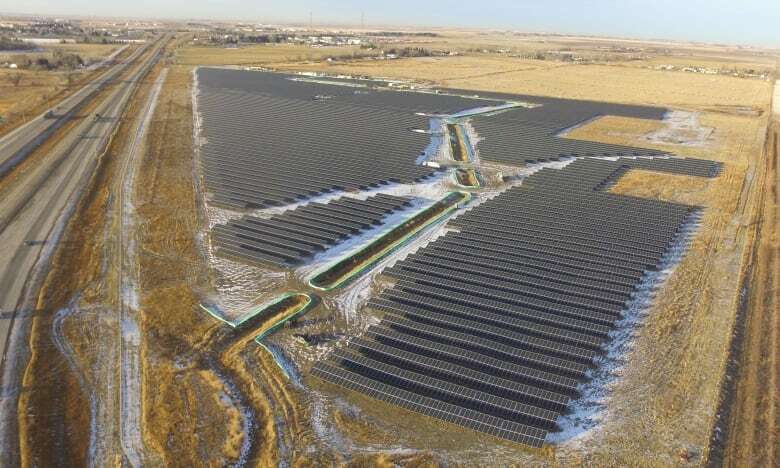 The Brooks project is the first of several renewable energy projects to be constructed in Alberta as the province shifts away from coal power plants. There usually isn't much to look at driving the Trans-Canada Highway through southeast Alberta, aside from the occasional bobbing pumpjack, the odd herd of cattle and the abundance of brown prairie grass. 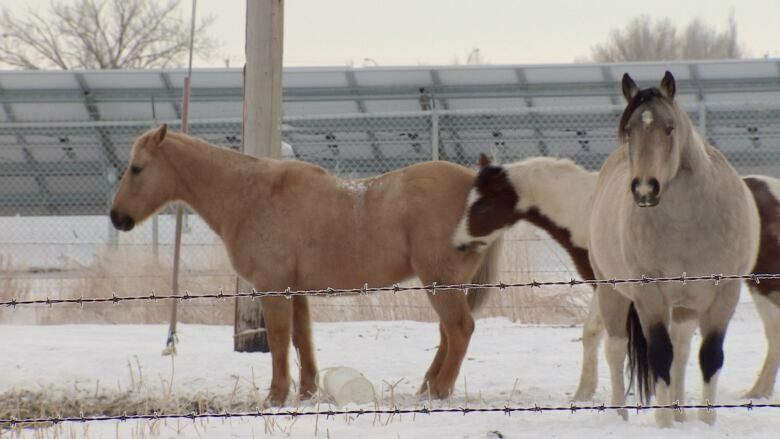 That's one reason why a new solar project outside the city of Brooks is so jarring. Seeing the 30-hectare site filled with solar panels is not only a sharp contrast to the landscape, but also to the province and its massive oil and gas industry. The 50,000 solar panels will collect enough sunlight to power 3,000 homes, according to Vancouver-based developer Elemental Energy. The Brooks solar project is more than five years in the making, although actual construction took seven months. There's a bit of an Alberta flair to the project. On the same land as the solar panels is an active oil pumpjack, a sour gas well, natural gas pipelines, an internet fibre optic cable and an agricultural irrigation ditch. "This area is agriculture and oil and gas, but it's really just resources. [Solar] is just another resource," says Graeme Millen, with Elemental Energy. "With the shared uses on this property between oil and gas, fibre optic, agricultural irrigation — it's a fantastic showcase for diverse resource development on Alberta land." 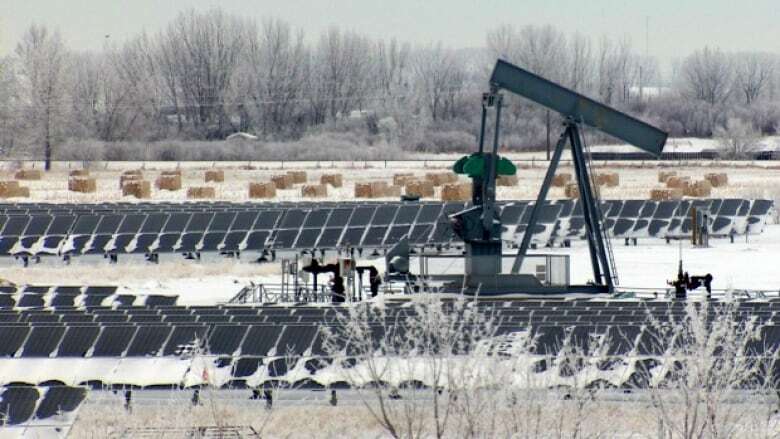 On this day, the solar panels are half covered in snow following a few days snowfall in southern Alberta. It's also the shortest days of the year around the winter solstice. The panels are still producing electricity, albeit far below their potential. "In the event it snows, you lose production, for sure. The good news is in this part of the world, in southeast Alberta, it doesn't snow that much compared to a lot of other jurisdictions," said Millen. "The snow is light so it blows off with the winds we have and because we get so many sunny days. Once the sun starts shining, the snow melts quite quickly." The project cost $30 million and developers received $15 million in grant funding from the former Progressive Conservative government through Emissions Reduction Alberta. Alberta is set to embark on a renewable energy revolution. Some renewable energy already exists in the province, but the sector is about to grow substantially. This month, the provincial NDP government announced partnerships with three companies to develop four wind farms, worth $1 billion. The projects will open in 2019. Collectively, about $50 billion is expected to be invested in developing renewable energy in Alberta and Saskatchewan before 2030 as both provinces strive to reach targets for how much of the electric grid is powered by wind, solar and hydro. The Brooks solar array may be the largest in Western Canada right now, but much larger projects are already in the works in the same region because of the sunny climate and proximity to several large transmission lines. "Right now this one is looking big, but pretty soon it may look small," said Molly Douglass, reeve of the County of Newell. "It's pretty exciting for our community." Douglass said she hasn't heard much reaction to the project in the community, other than people were surprised by how quickly it was built. Besides providing construction jobs in an emerging industry, she sees the long-term value of developing more renewable energy projects around Brooks. "The county has had a lot of linear taxation with oil and gas over the years and it's always good to diversify our income streams. That's something we've talked about for a long time," said Douglass. The utility company purchasing the power has not been announced.